The UK’s motorways will host their first trial of driverless car technology before the end of 2017, according to newly released documents from the agency responsible for managing England’s road network. 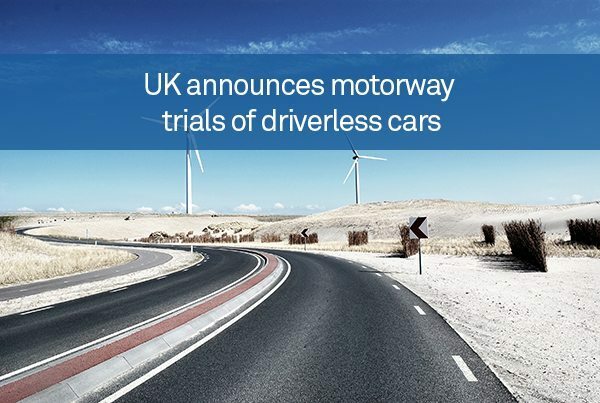 Highways England’s new innovation strategy, published yesterday (April 5th), reveals plans to test autonomous vehicles on the country’s M-roads “by the end of next year”, specifically in order to collect “real-world data on performance and potential impacts on capacity and operations”. The £150 million (€187 million) strategy also outlines a scheme to create a “connected corridor or ‘Wi-Fi’ road” on which cars and infrastructure are wirelessly connected so that real-time journey information – such as congestion and road closure warnings – can be delivered directly to motorists as they travel. The A2/M2 between London and Kent is named as a potential location for the trial. Other plans revealed in the documents include a trial of radar technology to improve detection of breakdowns and crashes, as well as a study of how sensors can be used to monitor the condition of infrastructure such as roads and bridges to facilitate more proactive and targeted maintenance. Commenting on the strategy, roads minister Andrew Jones described innovation as “absolutely critical” for the UK government’s £15 billion investment plan for roads. “A more reliable road network is good news for motorists and good news for the economy … Placing Britain at the forefront of innovation and research in this area will also create more jobs and investment,” he said.